The archaeology of Fiesole in northern Italy offers insights into the development of Etruscan civilisation and towns in ancient Etruria. Modern Fiesole is situated in northern Italy, 8km from Florence. Spread out over several of the nearby hills, it was an Etruscan town until its eventual conquest by the Romans in 90BC. 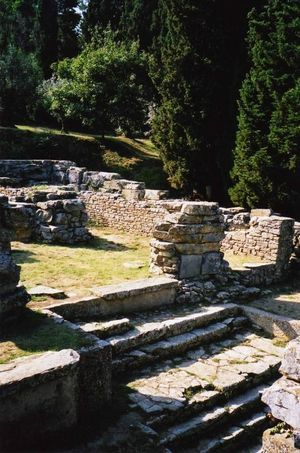 The archaeological site is rich in Roman remains. But in amongst them survive glimpses of Fiesole’s Etruscan past. Fiesole’s Etruscan name was Vipsl. The earliest city was probably founded in the seventh century BC during the early phase of Etruscan civilisation. This early settlement was probably walled. It was certainly establishing itself as a substantial urban centre. Excavations have found votive offerings of pottery and 40 bronze male and female figurines, and suggest that the town had at least two temples. Etruscan Fiesole owed its development to its commercial activities. Archaeologists have discovered that the town was involved in the manufacture of red earth pottery. A particular commodity was Pietre Serena stones which were used to mark boundaries and as burial markers. One particular burial stone from this period that survives is the Pietre Fiesolane or Fiesole stone. The stone is carved with 3 funeral scenes depicting a funeral banquet, a funeral procession and commemorative animal fights. This provides valuable information about Etruscan burial rites. Between the fifth and second century BC, Fiesole reached the peak of its prosperity. The town was by now involved not only in manufacturing but trade. Boundary stones show the extent of the town’s power, with its territory bordering those of Volterra and Arezzo, two Etruscan towns with which it had trade links. Fiesole also traded further north beyond the Apennines. Few discernible public buildings remain from this period as the roman conquest of the city involved the destruction of much of the Etruscan town. Archaeologists have identified an Etruscan temple of Minerva dating to this period. Several of the architectural decorations of the temple have been found and the votive offerings made to the goddess. These include several bronze body parts, showing that Minerva was petitioned for help with healing. It is known that the temple belonged to this particular goddess because of the discovery of Minerva’s symbol of a small bronze owl on the site. The Etruscan Temple. Found at the north of the site, this dates from the fourth century AD. It was reorganised and rebuilt after the Romans destroyed much of the Etruscan city when they conquered it in 90BC. The Etruscan temple was built on earth foundations overlaid with stone. From its surviving outer walls, archaeologists have been able to reconstruct its original layout. It was a rectangular building with a single central cella and two side chambers separated from the cella by columns. The cella was reached by a series of steps which led down to the altar. Both the altar and position of steps were altered in the Roman period. The City Walls. The surviving walls date to the fourth century AD and were built to strengthen Fiesole’s defenses in the face of Gallic incursions. They stretch for 2.5 km from east to west around the city on terraces that were connected by roads and steps. There are indications that earlier defenses existed. The walls were also partially rebuilt by the Romans. The Etruscan Tombs. Also known as the Via Bargellino tombs, these tombs are situated some way out of Fiesole, outside of the ancient city walls. In all, six tombs were discovered dating to the third century BC. Each tomb was built from large, uncemented blocks of stone. Each was rectangular with interior space maximised by the construction of platforms for cremated remains, reached by steps. Finds in the tombs have included parallel piped cremation urns with flat lids, a second century stone urn with a small illustrated box and an egg shaped urn of terracotta with a conical lid dating to the first century BC. Grave goods have included terracotta unguent containers and bronze personal instruments such as spatulas. De Marco, M (1999) Fiesole: Archaeological Site and Museum. Giunti Gruppo Editorial: Fiesole.